This article is by Sila. She lives in Barcelona, Spain where she teaches English and does translation work. Sila lived in England for five years where she realized that most Spanish speakers’ level of English is very poor, and having struggled with English herself, she wanted to help solve this problem. Her blog (Aprende Inglés-Sila) aims to make learning English fun, practical, and entertaining. For more information, check out Sila’s awesome blog! Si quieres leer este artículo en español, pincha aquí. One summer day you decide to go on vacation to the United States, going along more with your friends’ plans than anything else, mostly because long plane trips over immense oceans don’t excite you very much. But it doesn’t matter. You’re going with your friends anyway, so the long boring trip won’t be so boring. What you didn’t expect is that you would encounter so many obstacles that you’d need to learn to understand. And not because of your English level; you’ve already dedicated several years to learning it, but rather because no one has done a good job of explaining the behavioral rules (of American culture) to you. And she calmly goes and tells you that she’s very sorry, but there are none left. But you asked for it right after boarding the plane! You decide to complain, as is normal (for your culture), by raising your voice and telling the flight attendant to bring you a blanket from first class if needed, and if not, to take the necessary actions. Without batting an eyelid (without thinking), she leaves and returns with tons of forms to fill out (by hand, of course), telling you that when you finish filling them out to bring them to her. And of course, you have a choice to either continue wasting your time with the great blanket problem, which it’s clear you aren’t going to get anyway, or to take something out of your carry on suitcase to cover yourself with and go to sleep. You choose the second option; basically because it’s three in the morning your time and you can’t handle (you can’t endure) your tiredness anymore (nor the flight attendant). You find a sweater that you always keep with you for the terrible air conditioners and you go to sleep wondering what you’ve done to deserve this. You arrive at the magnificent, beachfront hotel at Miami Beach where you chose to spend a wonderful vacation of sand, sun, shopping and relaxing. The second problem: the rooms weren’t what you reserved. You complain again like you’re accustomed to doing – a menacing stare (we also call this the death stare), eyes wide, voice raised, and an unfriendly attitude. The receptionist gives you the same look as the flight attendant (again?) and behaves the same way, too. She doesn’t answer you, she doesn’t even blink, she leaves and comes back with more forms for you to fill out to explain clearly the how, when, where and why of your displeasure, what happened, the consequences of it, what you want to acquire, and the date of when it happened. This looks like an exam! Oh, of course, and in addition everything must be tripled, please, because we don’t have auto-copiable sheets. Plop. You’re starting to understand the matter. The thing is that when you complain about something or you’re not completely satisfied with some service or product, English speakers are the first to offer you instant solutions. They’re the kings of customer satisfaction, and in addition, they do it in such a way that they really get you to leave content in any situation, no matter how bad it is. What has happened is that their eardrums are a little bit sensitive and not only do they not support the raised tone of voice that Spanish (and Portuguese) speakers use all the time, but they also consider it a horrible habit that only shows that a person doesn’t know how to keep calm, and it’s rude, which is very, very repulsive to this culture. Anyone who doesn’t follow the normal rules of Anglo-politeness is out of place. Not only do they ignore you with contempt, but they also set in motion their self defense mechanisms (which basically consist of following strict procedure—i.e. a lot of paperwork). They have procedures for absolutely everything. They fill out paperwork, totally by hand because, contrary to what you might think, they’re not very automated. And then, wow, you wise up… you’re clever! That’s how you turn the page (change things). You’ve learned your lesson. You go shopping with your friends because some suspicious, black clouds have appeared over the horizon, so you quickly change your plan from spending the first day relaxing on Miami Beach’s golden sands. Right after you finish paying for the first outfit you’ve bought, you leave the shop and you realize that it’s ripped! What the hell? You return furious, your eyes become bloodshot… then you have a moment of clarity and you remember your recent complaining experiences. That’s how you decide to maximally apply, “when in Rome, do as the Romans do,” by imitating the behavior of your American friends that are so wise that in just 24 hours they’ve managed to teach you how to act in their country. You take a deep breath, you count to ten. You don’t blink. You put on the same face as the flight attendant and, raising your voice (just a little bit in order to smoothen your voice), you first say the magic word, sorry, because “sorry” is like saying “hola/óla” (or hello) for Spanish/Portuguese speakers, and it basically serves to pave the way towards your malevolent objective. You proceed to explain extremely calmly, without showing your anger and with a big smile, what happened with your purchase. You do the following, you nicely ask for a refund of your money in a firm demand (although suavely and politely). You continue without blinking, and continue smiling the whole time. The saleswoman begs for your forgiveness. She offers you a thousand alternatives. She exchanges the outfit without even asking to see the sales receipt, and she even offers you not only a coupon for VIP customers so you can choose an accessory from the recently launched summer collection—you already saw a cute necklace that goes with your dress—but she also gives you another coupon (the Americans are also the kings of coupons) so that you can get a free soda (refreshment), on the house. You’ve learned your lesson! Friendliness is the best way for you to get someone to pay attention to you. You must be firm, of course, but you don’t have to lose your composure. If you had known that in the plane, you surely would have gotten to ride in first class with seven gold-embroidered blankets, talking to some celebrity! Interesting, I really didn’t know about that American’s behaviour. Yea, it’s a cultural difference. 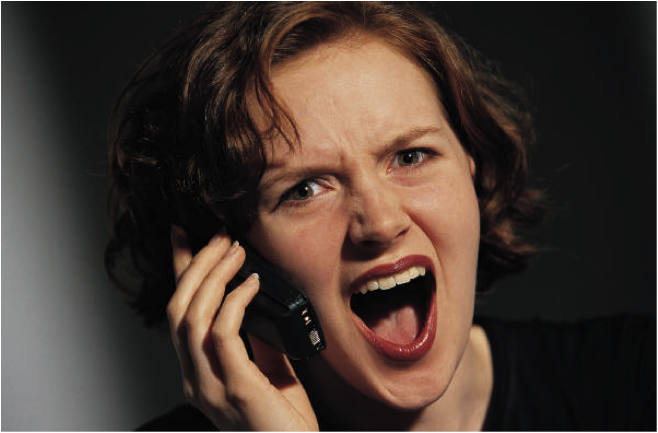 We often innately believe that when someone raises their voice, they’re being hostile. it's best to be nice always, regardless.